The future is a dark one as the dead have risen to feast upon the living. Cities have been shattered, neighborhoods torn apart, and humanity is hanging on by a thread. Massive hordes of zombies gather under the control of Overlords, zombies that have retained some of their memories and intellect, and have gained powerful psychic abilities driven by their hatred of man. Pockets of civilization exist around the globe; centered around dynamic heroes whose leadership and prowess in battle spur the populace to fight back and even rebuild. 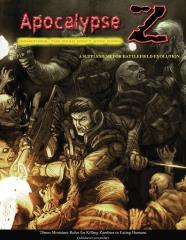 Apocalypse-Z is a supplement for Battlefield Evolution and allows you to play tabletop battles ranging from small skirmishes to outright wars between zombies and the remnants of mankind. • several “Short Attention Span” guides to make playing Apocalypse-Z easy.